Parents with infants, toddlers and small children feel secure in having their most sensitive family members receive acupuncture from Agape Acupuncture, Inc. knowing it is non invasive and not harmful to them. We are very gentle with the youngest members of your family and we constantly receive loving notes and drawings from our young patients, who are not fearful of coming to our clinic. This is a testament to the way our clinic administers acupuncture – that it is painless, and the results and outcomes are genuine and enduring. Babies cannot produce placebo effects. 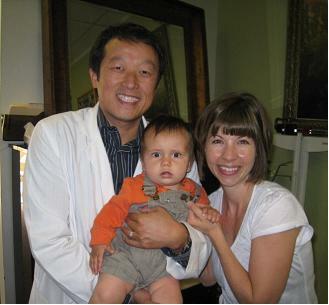 Dr. Kevin Huang is great with kids and he offers gentle treatments and baby acupuncture. There is no pain and we love your little ones. We help children with acupuncture and herbs for seizures, epilepsy, asthma, sinus problems, congestion, sinusitis, runny nose, wheezing, cough, & colic. We are a family clinic and appointments are easy to make. YELP 5 STAR REVIEW BY M.C. FULLERTON, CA Super clean facility.... staff is wonderful with beautiful welcoming smiles. Doctor is 4th Gen, very knowledgeable. YELP 5 STAR REVIEW BY SCOTT D. IRVINE, CA Having dealt with severe back pain and neck flares I was so overwhelmed. Physical therapists from other practices were just guessing, but Dr. Huang has helped me manage the pain and improve my condition. Agape is respectful and encouraging! Habitual Miscarriage, Infertility & Sterility, Sperm Conditions (Asthenospermia & Teratozoospermia), Erectile Dysfunction (ED), Low Sperm Count, Hemorrhaging, Endometriosis, Elevated FSH, Vulvodynia, Menstrual Conditions & Female Conditions, Anemia, Endometriosis, Interstitial Cystitis (IC), Fibroid Tumors, Follicular Cysts, Polycystic Ovarian Syndrome (PCOS), Irregular Periods, PMS, Cramps, Premature Ovarian Failure, Abnormal and Painful Periods. 5 Star Review by V.B., Yorba Linda, California: I came to Agape Acupuncture (literally in tears) from a bout of insomnia where I would wake up around 2 AM or earlier and not be able to get back to sleep. As a mother of two little ones this was very difficult and was taking a great toll mentally and physically. I was experiencing extreme fatigue and brain fog. I had already been diagnosed previously with adrenal fatigue the prior year and am on a specific detox/nutrition program, but the insomnia is a whole new beast. I’m a firm believer in natural medicine, herbs, and food as medicine but it takes a skilled healer(s) to apply these with good results. Plus everyone’s body is unique. Dr. Huang ran a simple diagnostic and was not surprised by the symptoms I was having based on the test results. Various organ systems were way out of balance. He prescribed a treatment plan and was quite confident that it could be of great help but would take time. I am three months into my treatment plan with acupuncture and can say my sleep has improved 80% and keeps on improving. Ironically, I often fall asleep during a treatment as they are so relaxing! The rooms are very clean and calming. I still hit a few bumps in the road, but those days are becoming fewer so that tells me healing is occurring. Adrenal fatigue doesn’t happen overnight, so I don’t expect overnight healing. You can tell Dr. Huang cares a great deal for his patients as does his staff. 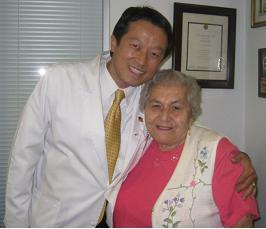 I believe Dr. Huang and Agape Acupuncture were an answer to prayer in my healing journey. He is Christian and gives God the glory for healing. He uses the wisdom of Eastern Medicine to treat the whole body. I will definitely be recommending Agape Acupuncture to friends and family. On a side note, the office is filled with patient testimonials of healing with a wide range of ailments/diseases and all different ages. 5 Star Review by Nina E., Orange, California: My first session yesterday, and the pain in my arm has almost disappeared, I'm going back today since he wants to see me 3 times this week, I can actually put on my bra now, I couldn’t do that before. I had to put it on like a t-shirt or twist it around like a pre-teenage girl to the front! Thank God for this Man, very gentle very assuring, thinks he can cure me from diabetes, thyroid, and back pain, I’m willing to give him a chance, price but my health is not negotiable! and since I have been paying the Chiro for so long, what a waste of money that turned out to be!! Only thing is… every time I get acupuncture, I also get my period, does this happen to anyone else? I was not due for another 2 weeks!! This would be the only negative!! 5 Star Review by Elizabeth.Y., Santa Ana, California: Dr. Huang and the staff are very caring and really makes an effort to give the best care possible! 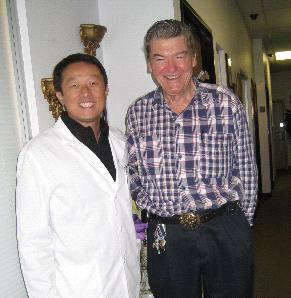 Dr. Huang has helped me numerous times and is very knowledgeable in what he does. Highly recommended! Incredible care and experienced staff! Thank you! 5 Star Review by Rosie K., Orange County, California: My anemia went from an 8 hemoglobin count to a 14 in 2 months. My numbing and tingling is 80-90% better in 2 months. If I could afford to go the 3 times a week, I’d be completely healed but I can only go once maybe twice a week. I feel immediate relief every visit. 1/1/2014 – Update – I have been symptom free for several months now. I have another issue that came up recently which I am going back for, but the previous neuropathy and numbing is all gone. Yeay! Thanks so much, Dr. Huang and all his caring staff. We help patients with acupuncture and herbs for painful cysts, fibroids, and tumors. We offer acupuncture and herbs for immune conditions and strengthening immune function, lymph nodes and acupuncture and herbs for various viral, fungal, parasitic and bacterial infections. We help patients with acupuncture and herbs for infertility, acupuncture and herbs for natural fertility, acupuncture and herbs for pregnancy, and acupuncture and herbs for frequent miscarriages. There is hope because Natural Medicine works. We offer effective treatment programs for female conditions and reproductive disorders: endometriosis, PMS, abnormal menstrual cycles, acupuncture fertility, IVF and AI. We help patients with acupuncture and herbs for PCOS, unexplained infertility, reproductive disorders, migraine headaches, fatigue, hormonal imbalance, and recurrent miscarriages. Acupuncture and herbs for low sperm count, impotence, and erectile dysfunction (ED). Polycystic Ovarian Syndrome (PCOS), Menopause Syndrome, hot flashes, and acupuncture and herbs for frequent miscarriages. These are real patients and we do not pay or compensate them in any way for giving us their testimonials and reviews. We have never paid for a review or testimonial - that's how you know they are true and trustworthy. They have each signed waivers and are sharing their joy of recovery to give you hope and encouragement. They are 100% real and accurate patient accounts and are medically documented with charts, necessary examinations, blood work, lab work and/or medical and hospital records. Natural medicine works, Chinese herbs, Nutrition, Traditional Chinese Medicine TCM Works - safely, effectively and without bad side effects. We offer natural therapy for many different ailments. We are excited for you meet our little girl, Sarah. She is a gift from God! Despite my physician’s warnings concerning my fertility and auto-immune disease, I was able to conceive and I had a surprisingly easy pregnancy. Natural Medicine strengthened my body, overcoming various issues, including hypothyroidism and incapacitating periods. The results of the acupuncture and herbal teas were amazing and even surprised my physician. Natural Medicine treats the cause of the illness and does not cover up symptoms. We help patients strengthen the body, promote healing, combat fatigue, improve energy, and benefit immune function. ACUPUNCTURE IS FDA APPROVED TREATMENT | PAINLESS, SAFE AND GENTLE | OUR CLINIC IS MD RECOMMENDED | TRADITIONAL CHINESE MEDICINE (TCM) | ALL SUPPLEMENTS ARE MADE IN THE U.S.A.
We help patients with acupuncture and herbs for painful cysts, fibroids, and tumors. We offer acupuncture and herbs for immune conditions and strengthening immune function, lymph nodes and acupuncture and herbs for various viral, fungal, parasitic and bacterial infections. We help patients with acupuncture and herbs for infertility, acupuncture and herbs for natural fertility, acupuncture and herbs for pregnancy, and acupuncture and herbs for frequent miscarriages. There is hope and natural healing. Natural Medicine works. ACUPUNCTURE | ACUPRESSURE | NUTRITION | HERBS | HERBAL MEDICINE | DIETARY SUPPLEMENTS | DIET | FOOD THERAPY | Agape Acupuncture, Inc. has been awarded the “Best Of Orange County Award”. Patients who come to Agape Acupuncture are from all walks of life, from the young to the elderly, and many are medical professionals themselves, including medical doctors, physicians, nurses, chiropractors, acupuncturists, and post graduates. If you have a specific illness or if you have questions, schedule an appointment for a FREE individualized consultation. Your treatment plan and progress are monitored by a qualified and experienced medical professional. Our natural medicine treatments are personalized and tailored for your body's needs. Call 714.979.9790 to schedule an appointment today. “Dr. Huang and his staff are amazing.They are incredibly caring, knowledgeable and skilled at what they do. if you have “tried everything” and you’re not sure what else there is to do, give Dr. Huang a try." Our Clinic Receives Best of Orange County Award Best Acupuncturist & Herbalist 8 Years in a Row 2009-2016 Award Plaque Honors the Achievement - WASHINGTON D.C. - South Coast, Costa Mesa has been selected for the Best of Orange County in the Medical Acupuncturist & Herbalist category CA. The "Best of Local Business" Award Program recognizes outstanding local businesses throughout the country. Best Acupuncturist & Herbalist Costa Mesa, Acupuncturist Santa Ana, Best Acupuncture Irvine, Acupressure and Herbalist Irvine, Best Acupuncturist & Herbalist Orange County, California Caring Doctors and staff! Dr. Kevin Huang, NHD, JD, L.Ac., Dr. Janet Yeh, Ph.D., M.Sc., L.Ac. We offer acupuncture for South Coast Metro, Costa Mesa, Santa Ana, Irvine, Newport Beach, Newport Coast, Corona Del Mar, Laguna Beach and Huntington Beach. We have treated over 45,000 patients and are 4th generation in natural medicine. Our treatment methods are from the Emperor's Royal Physician of the Qin Dynasty. Our family has been serving patients in the United States since 1980 and serving California for 30 years. Our patients include pastors, physicians, doctors (MD & Ph.D.), nurses (LVN & RN), chiropractors, licensed acupuncturists, post-graduates, and other healthcare providers. We received Best of Orange County award Best Acupuncturist & Herbalist. Dr. Kevin Huang and Dr. Janet Yeh - We pledge to you our dedication to top quality medical excellence. We provide gentle loving care for our patient family. ACUPUNCTURIST SERVING LOS ANGELES COUNTY, SOUTHERN CALIFORNIA – Agoura Hills, Alhambra Arcadia, Artesia, Avalon, Azusa, Baldwin Park, Bell,Bell Gardens, Bellflower, Beverly Hills, Brentwood, Burbank, Calabasas, Carson, Cerritos, Claremont, Commerce, Compton, Covina, Culver City, Diamond Bar, Downey, Duarte, El Monte, El Segundo, Gardena, Glendale, Glendora, Hawaiian Gardens, Hawthorne, Hermosa Beach, Huntington Park, Industry, Inglewood, Irwindale, La Mirada, La Puente, La Verne, Lakewood, Lancaster, Lawndale, Lomita, Long Beach, Los Angeles, Lynwood, Malibu, Manhattan Beach, Monrovia, Montebello, Monterey Park, Norwalk, Palmdale, Palos Verdes Estates, Paramount, Pasadena, Pico Rivera, Pomona, Rancho Palos Verdes, Redondo Beach, Rolling Hills, Rosemead, San Dimas, San Fernando, San Gabriel, San Marino, Santa Clarita, Santa Fe Springs, Santa Monica, Sierra Madre, Signal Hill, South El Monte, South Gate, South Pasadena, Temple City, Thousand Oaks, Torrance, Vernon, Walnut, West Covina, West Hollywood, Westlake Village, Whittier, Acton, Agoura, Agua Dulce, Altadena, Baldwin Hills, Bell Canyon, Belmont Shore, Cabrillo, Calabasas Hills, Canoga Park, Canyon Country, Castaic, Catalina, Century City, Charter Oak, Chatsworth, City of Commerce, City of Industry, Crenshaw, Del Sur, Dominguez, Eagle Rock, Echo Park, Encino, Granada Hills, Hacienda Heights, Harbor City, Highland Park, Hollywood, La Canada, La Crescenta, Lincoln Heights, Mar Vista, Marina Del Rey, Mirada, Mission Hills, Newhall, Northridge, Pacific Palisades, Pacoima, Palms, Panorama City, Phillips Ranch, Pico Heights, Playa Del Rey, Playa Vista, Porter Ranch, Rancho Dominguez, Reseda, Rowland Heights, San Pedro, Saratoga Hills, Sepulveda, Sherman Oaks, Silver Lake, Stevenson Ranch, Studio City, Sun Valley, Sun Village, Sylmar, Tarzana, Topanga, Tujunga, Universal City, Valencia, Van Nuys, Venice, Verdugo City, Vermont, Watts, Westchester, Windsor Hills, Winnetka, and Woodland Hills.